Myanmar government leader Aung San Suu Kyi said on Tuesday her relationship with the military – which held her under house arrest for nearly 15 years – was “not that bad” and that the generals in her cabinet were “rather sweet”. Myanmar sold out 6,841 brand new cars until 2018 June, with a 114 percent rise compared to the same period of the previous year. Among ASEAN countries, Myanmar stands at the top in development, reported by ASEAN Automotive Federation. The average inflation rate is expected to hit 5.91 per cent in 2018-2019 FY which will start on October 1 despite the local currency depreciation and rising commodity prices, according to the Ministry of Planning and Finance. Myanmar authorities arrested and tortured Rohingya refugees who reentered Rakhine state from Bangladesh for livelihood purposes, Human Rights Watch (HRW) said Tuesday in a report that cast doubt over promises by Naypyitaw for the safe repatriation of Rohingya. Amid criticism of the government from the business community over sluggish growth and a lack of economic direction, the economic adviser to Myanmar State Counselor Daw Aung San Suu Kyi on Friday addressed the problems the administration has had implementing its reform plan, while highlighting the progress it has already made and insisting that major new reforms are on the way. Myanmar State Counsellor Aung San Suu Kyi is expected to be stripped of her Freedom of Edinburgh over her failure to condemn the Myanmar military’s persecution of the Rohingya, the Scotsman has reported. In light of this, labor authorities from Cambodia, Laos, Myanmar, Thailand and Việt Nam (CLMTV) are working to guarantee migrant workers’ access to social security when overseas. Yangon police have arrested a 19-year-old man who is suspected of secretly filming women using a restroom at the Myanmar Plaza shopping mall in Bahan Township. Pyithu Hluttaw MP U Pe Than from Myebon Township, Rakhine State has called on the government to clarify the issue on the water pollution and the changing of water color in some rivers in the Rakhine State due to contradictions in the statements released by the government and the Advancing Life and Regenerating Motherland (ALARM). 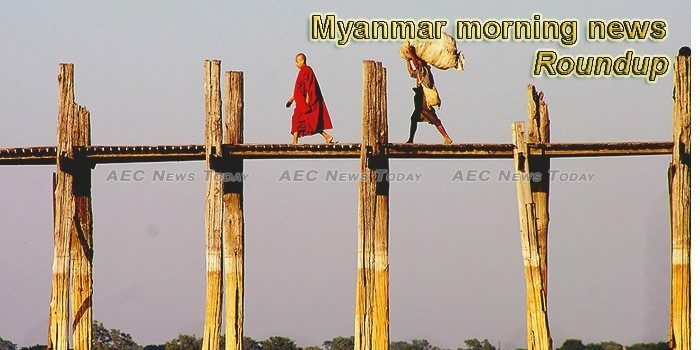 Southern Myanmar Development (SMD) Co., Ltd will suspend the collection of Ks 500 monthly service fee and stop providing street light in Lamaing town and nearby villages in northern Ye Township, Mon State since the service fee was not included in the agreement, according to a copy of a letter sent by the company. After less than two months online, the popular Myanmar meme page @baelachaung has disappeared from Instagram, along with all of its content. Around seven million Yaba pills have been seized within a period of three and a half months from May 2 to August 17 in the Rakhine State. Auditor General urged the government to set appropriate plans for Hanthawady airport project as over K5 billion are spent for the project which started in 1994, according to a report submitted by Public Accounts Committee during a parliament session held on August 20. The Mon State government said it has provided Ks 55 million for the Karen (Kayin) traditional wrist-tying ceremonies in the Mon State. Thura U Shwe Mann is currently chairman of the Union Parliament Legal Affairs and Special Cases Assessment Commission and a man who has been intimately involved in Myanmar’s transition from military dictatorship to a quasi-democracy, an ongoing process. The Ta’ang National Liberation Army (TNLA) says it detained an ethnic Shan woman in the town of Namkham in northern Shan State on August 17 so that she could face action under the ethnic armed group’s justice system. Tanaung National Liberation Army (TNLA) said that after holding the 21st Panglong Summit, clashes occurred a grand total of 15 times between military forces and TNLA. A second wave of flooding has hit multiple parts of Myanmar including Karen and Mon states and Irrawaddy and Tanintharyi regions, as water from rivers continues to rise in locations where hundreds of people have been displaced from flooding. Under the guidance of State Counsellor Aung San Suu Kyi, Kyaikkansan sports ground has been planned to change into Aung San National Green Park, condo and sports ground project in conjunction with Japan. The former United Nations secretary-general and Nobel Peace Prize laureate Kofi Annan died on Saturday at the age of 80. Despite his top job at the UN, the Ghanaian is remembered in Myanmar for his involvement in tackling the crisis in Rakhine State in the west of the country, where communal strife between ethnic Arakanese and Rohingya Muslims had been on the rise since 2012. Myanmar’s de facto leader Aung San Suu Kyi on Tuesday (Aug 21) defended the steps her government has made in handling the Rohingya crisis, amid global criticism on the issue. Inter-communal violence will remain in Myanmar’s troubled Rakhine state as long as terrorism persists, with the threat potentially bringing “grave consequences” not just to the country but other nations in the region, its leader Aung San Suu Kyi said. Myanmar State Counselor Aung San Suu Kyi on Tuesday highlighted the country’s sustainable development plan, which is seen as a roadmap in its democratic transition. The Ta’ang National Liberation Army (TNLA) and Tatmadaw (government military) have had 15 clashes since the completion of the third session of 21st Century Panglong Conference which was held in July this year.